In May, comedian Alan Carr invited English television presenter Phillip Schofield on to his show. This episode included alcohol which is unsurprising as Carr is known for having his drinks cart nearby and offering his guests drinks of their choice. On that episode though the two faced off in a drinking roulette game where they spun to see which shot they had to take. In order to win they had to hold a straight face after downing it which by the end it was decided that they tied. 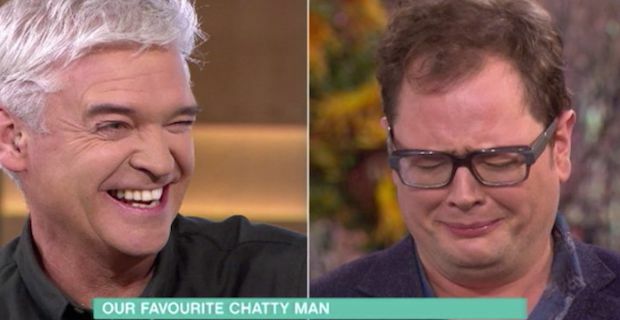 Tables were turned this morning though when 53 year-old Phillip Schofield and Holly Willoughby invited Alan Carr to their show, This Morning. It was time to decide who was the winner once and for all as they faced off in a drinking competition live on TV. With a bottle of tequila and shot glasses each with tequila worms, they were ready to see who was the champion. Similar to the last challenge, they had to keep a straight face after taking the shot. After both took the shot, Phillip stared straight faced into the camera while Alan Carr was a different story. As soon as he took the shot,his face went a bit squeamish as the tequila worm was apparently stuck in his throat. Needless to say, Alan lost the battle once and for all.